Comments Off on Bolahood’s Hat Trick Leads Bruins Past Ice! Bolahood’s Hat Trick Leads Bruins Past Ice! (Photographer: Jaiden Irven and Alison Hodgkinson) Jake Joosten makes a glove save in the first period and a fan salutes the hat trick. Jake Joosten backstopped the Bruins to a 6-0 shutout win over the Ice tonight at the Bear Den stopping all 25 shots and Patrick Bolahood got a hat trick providing the offence during the Bruins 47 shot barrage at the Ice goalie Dawson Barnard. It was Bolahood opening the scoring in the first and Aiden Rielly scored the first of two for a 2-0 lead after one period of play. Bolahood got his second on the night and Reilly also picked up another one for a 4-0 lead heading into the third period. Then it was Marshall Lockhart scoring his first junior c goal for a 5-0 Bruins lead. Bolahood’s hat trick goal made it a 6-0 final. 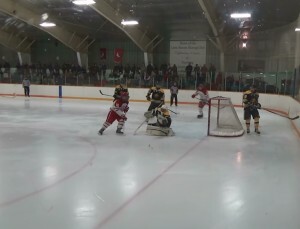 The Bruins next home game is Friday Jan.8th at 7:45 pm vs the Clarington Eagles. Comments Off on Bruins Suffer Fourth Consecutive Loss! Bruins Suffer Fourth Consecutive Loss! Photo: (Branden Francey makes a glove save during action tonight at Little Britain). 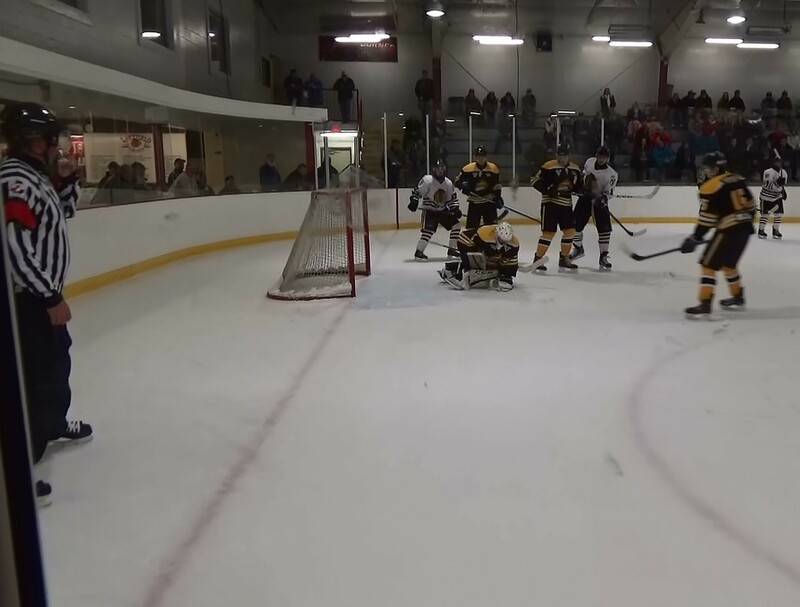 Alex Siblock was the only Bruins player to beat Garrett Haden in the Merchants net tonight as they fell 4-1 to the Merchants in Little Britain. 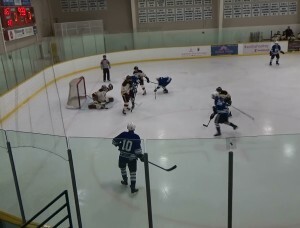 They were tied 1-1 after the first and the Merchants took a 2-1 lead into the third where it stood until Little Britain added 2 empty net goals. Branden Francey stopped 36 of 38 shots while Haden faced 30 shots saving 29. 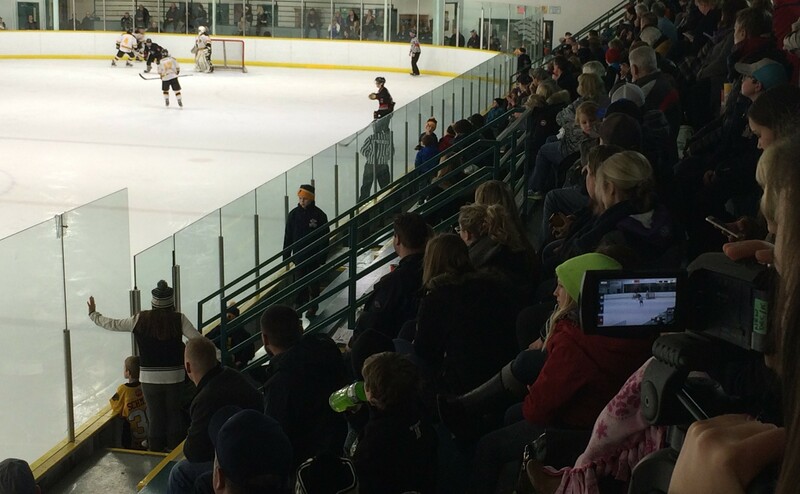 Uxbridge hosts Georgina Ice on Tues Dec.29th at 8:10 pm. Comments Off on Bruins Trounced in Port! Despite out shooting the Mojacks 48 to 44 the Uxbridge team only got one past the Mojacks tender in a 6-1 loss in Port Perry today. It was 4-0 after one period in which starter Jake Jooston was replaced by Branden Francey and 5-1 after two. Adam Bartholomew got the lone Uxbridge goal. 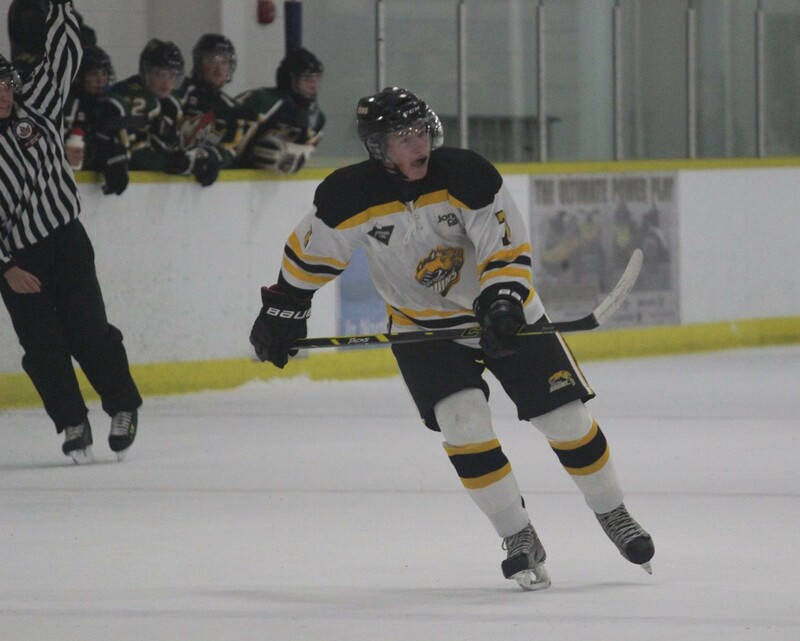 The Bruins next home game is Tues Dec.29th at 8:10 pm vs the Georgina Ice. 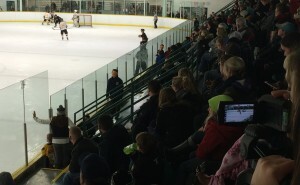 Comments Off on Bruins Lose Another in OT to Clarington! Bruins Lose Another in OT to Clarington! 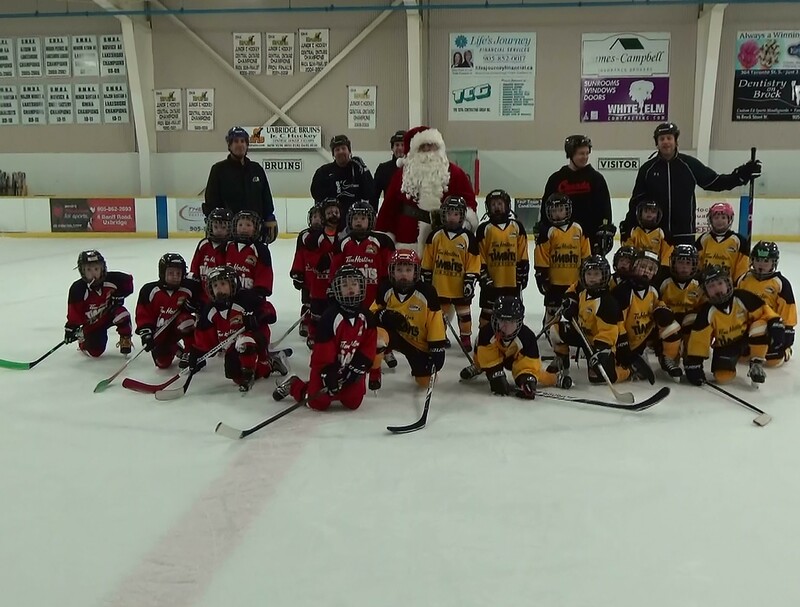 (Photo’s: Jaiden Irvin, A large Bruins Crowd last night and Santa with players from the Initiation league’s Hawks and Penquins). On Santa Claus night at the Bear Den, the Bruins started out with a very strong performance as they opened up a 2-0 first period lead, but it ended up in a loss to the Eagles in OT. From the face-off in the Bruins zone Thomas Swift fed Colby Gardner and he let go a hard slap shot from the left side that beat the Clarington goalie. Marco Mastrangelo picked up the second goal as he took Daryl Thomson’s pass from behind the net and fired into the open cage. But Clarington scored two goals on the power play to tie it and then won in overtime just 18 seconds in, for a 3-2 final. This marks the Bruins 4th OT loss to Clarington this season. The Bruins next home game is Tuesday Dec.29 at 810 pm, Merry Christmas to our Bruins Hockey Fans! Comments Off on Bruins Lose in Lakefield Tonight! 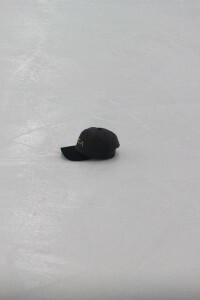 Bruins Lose in Lakefield Tonight! The Bruins opened up the scoring on a goal by Patrick Bolahood in the first period but a 1:29 later the Chiefs tied it up and took the lead with 45 seconds remaining in the first period on a shot that just cleared the red line for a goal. Lakefield added two more goals in the second before a third period tally by Daryl Thomson on the power play got the Bruins within two. Uxbridge could not complete the comeback as they fell 5-2 on an empty net goal with 27 seconds remaining in the game. 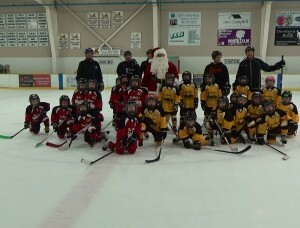 Uxbridge Host the Clarington Eagles on Friday Dec.18th with Santa making a special appearance at the game. Comments Off on Bruins Updated Facebook Page! 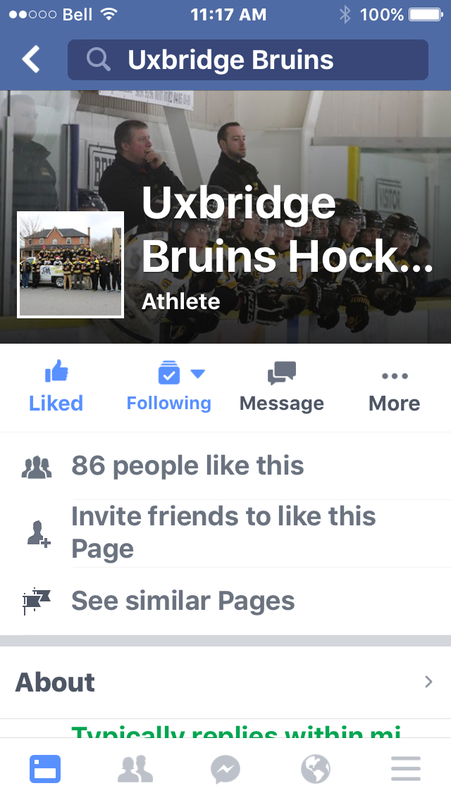 The Uxbridge Bruins are pleased to show a new look Facebook page courtesy of Alison Hodgkinson. Alison is an avid photographer as you will see by the action shots from the games she has taken and the team events she has covered such as the Santa Claus parade. We encourage our fans to browse through the page that Alison has created. You can get to it by our FB icon on the home page or at the following link. 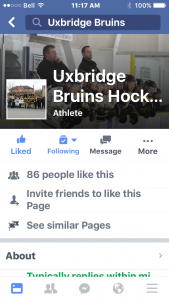 It is called “Uxbridge Bruins Hockey Club” if you are using a search bar to find it. Enjoy the Bruins on Facebook! Comments Off on Welcome Back Frecks and Newcomer Thomson! Welcome Back Frecks and Newcomer Thomson! 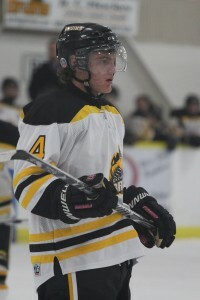 The Uxbridge Bruins GM Ron Archibald and his staff were busy making changes last week as they added a forward in Uxbridge native Robert Freckelton (#7) who played with the Bruins last year as well as defenceman Brett Thomson (#4) (Daryl Thomson’s Brother) in a trade with the Georgina Ice. A huge Bruins welcome from the entire Bruins Family. The Bruins also released forward Dylan Pollard and we thank him for his time with the Bruins hockey club. 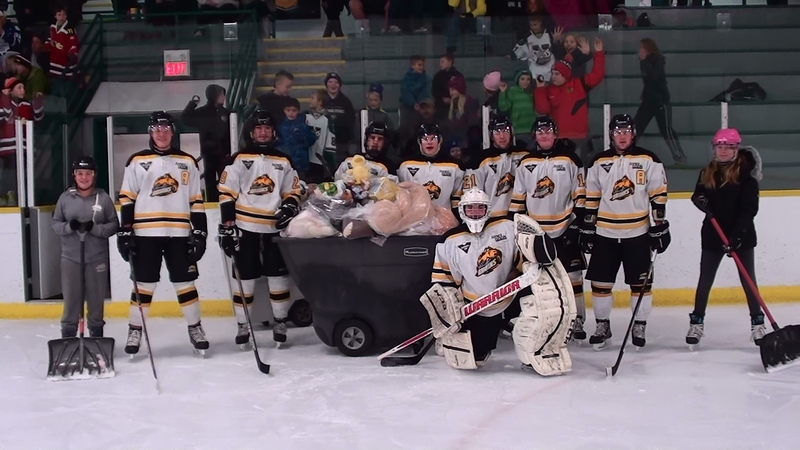 Comments Off on 207 Bruins assist Coby Gardner on Teddy Bear Toss Night! 207 Bruins assist Coby Gardner on Teddy Bear Toss Night! 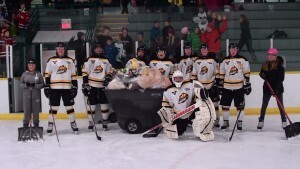 It only took one goal for the Bruins to defeat the Port Perry Mojacks on Teddy Bear Toss Night and when Coby Gardner scored, 207 teddy Bears rained down on the ice. Ryan Miehm and Brady Baker also assisted on the play as the game was delayed four minutes as the ice was cleared by the Bruins players and volunteers. Thx to all our “Fans” for helping the Bruins support the Uxbridge Toy drive. There was no one who could beat Branden Francey on this night as he turned aside all 41 shots he faced for the shutout. Comments Off on Bruins pick up a win over the Ice! Bruins pick up a win over the Ice! 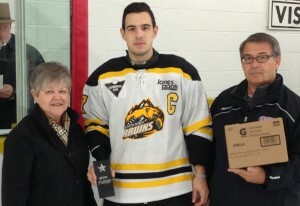 Photo: Central Convener Liz Bassinger and OHA Junior Chair Terry Lynch, present Marco Mastrangelo with the November Player of the month award. The Bruins came out flying last night as they scored three first period goals to take a 3-1 lead into the intermission. Alex Siblock with two and Wes Cowie scored the goals. 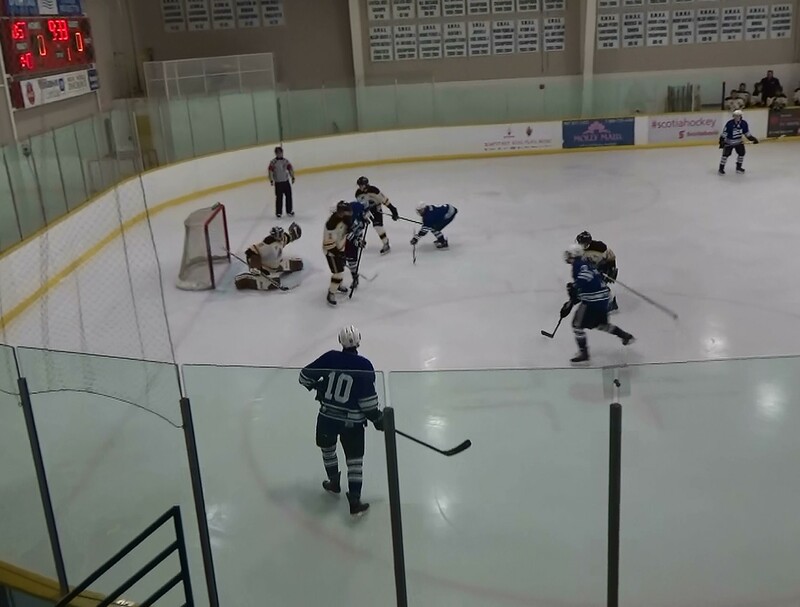 The ice made it close scoring early in the second to trail by one but Uxbridge pounded the Ice net with 3 power play goals, two by Daryl Thomson and Brady Baker got the other. Aiden Rielly added a third period goal for a 7-2 final as Jake Jooston improved his record to 8 wins and 3 losses on the season. This Friday Dec.11th the Bruins host the Port Perry Mojacks on Teddy Bear Toss night, where you get to throw your teddy bears onto the ice after the first Bruins goal. the game starts at 7:45pm, get there early so as not to miss out on the toss! Comments Off on Are you Ready for the Bruins Teddy Bear Toss! Are you Ready for the Bruins Teddy Bear Toss! 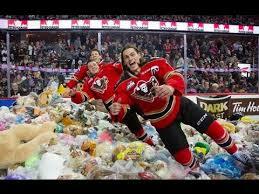 Check out the Calgary Hitmen Teddy Bear Toss! The Bruins Teddy Bear Toss is this Fri. Dec.11th. Help us support the Uxbridge Toy Drive!